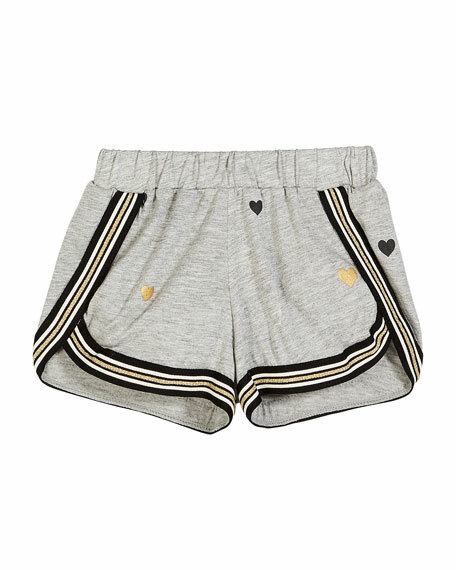 adidas by Stella McCartney "Run Adizero" running shorts. Mesh waistband with logo print. Loose fit offers room for movement. Back zip pocket with reflective details. For in-store inquiries, use sku #2571839. Fenty Puma by Rihanna nylon woven shorts. Yin-yang sign and puma cat logo. Contrast side snaps. Elasticized waistband. Relaxed fit. Pull-on style. Imported. Flowers By Zoe shorts with mixed heart print. Contrast striped taping. Elasticized waistband. Cutaway sides. Body: rayon. Trim: polyester. Imported. Heroine Sport training shorts with side stripe. Elasticized waist with logo patch. Vented sides. Pull-on style. Polyester. Made in USA of Italian materials.